… we’ve rounded up the greatest places to get a curry (of all types) across the land. Winners of the Best Curry In Ireland at the Eaties awards last year voted for by JustEat.ie customers, who probably know their stuff, to be fair. Those who are regulars to Ravi’s often comment on the stairs up to the restaurant, but say that it’s ‘worth the climb’. Try the chicken chettinad. Rated as the best Indian restaurant in the country on Trip Advisor. Food, service and particularly curries come highly recommended here. Haveli’s head chef is New Dehli born and trained, and receives consistently excellent reviews. This Thai restaurant also has a sister takeaway in Rathmines. The massaman and Thai green curries come highly recommended. Delicious authentic Thai cooking in the heart of Ireland. Their Lao Curry is a beauty to behold. Try their ledo bedo, a traditional Nepalese curry. (They’re also involved in the €10,000 Curry event to raise money for victims of the earthquake in Nepal in Smock Alley on 24 May). Consistently great fare from this Cork institution. Their a la carte menu offers a solid range of classics. Number 22 out of 1828 restaurants in Dublin on Tripadvisor. Not too shabby. A favourite with the locals. Try the Fai Dang curry. Despite having a variety of non-Indian dishes (Chinese, Thai, Italian) on the menu, this place is a favourite with locals for its “curry straight, well cooked and with super ingredients – not fancy or pretentious” (TripAdvisor). A peek inside Diwali on any day of the week is testament to how popular it is. Delicious Indian and Nepalese fare in the heart of Dublin city centre. One of Dublin’s best known takeaway chains, with restaurants in Ashtown, Bray, Clonskeagh, Fairview, Glenageary, Rathfarnham and Rathmines. It’s been described as “drool inducing” and “the best Indian in the country”. This Waterford favourite offers a sit in or takeaway option. Kinara Kitchen in Ranelagh and Kinara Restaurants in Clontarf and Malahide offer some of the best Pakistani and Eastern cuisine around. They’re also renowned for the Kinara Tent at the Electric Picnic every year. Food is glorious, tried at least 1/3 of the menu and never failed to disappoint me! Great service, the friendliest staff I’ve ever seen! And food is just divine ! ! Can’t recommend highly enough! Sadly the George’s St branch of Jaipur has closed following the sale of the building, but the restaurants in Dalkey, Ongar and Malahide (along with Chakra in Greystones and Ananda in Dundrum, all owned by the same guy) are still going strong. 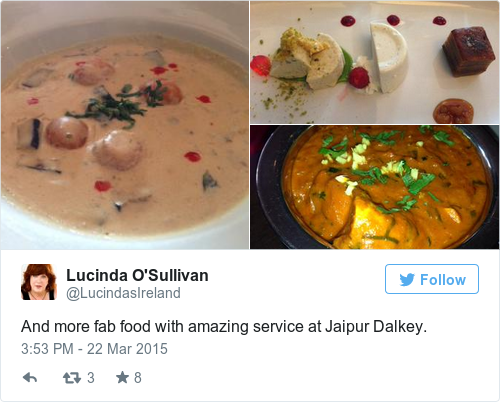 Email “17 places to eat a curry in Ireland before you die ”. 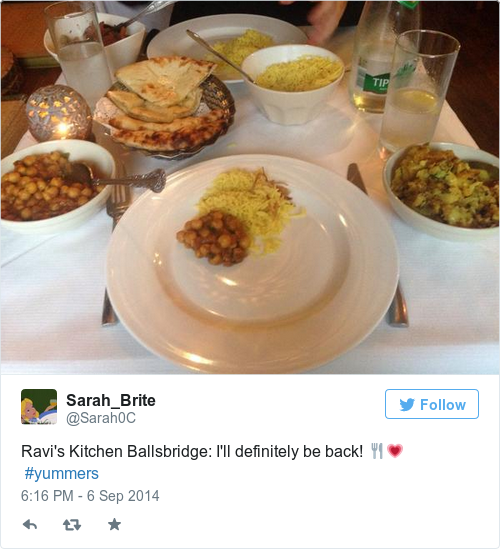 Feedback on “17 places to eat a curry in Ireland before you die ”.